As the field of OSR that my hives are next to has gone over (finished flowering) and turned from bright yellow to a shade of green it was time to check and extract the honey from the hives before any of it crystallizes and sets rock solid in the comb. So it all started early Friday morning for me with a couple of hours beekeeping before work! I had to add a new super to each hive, for space and something for the bees to work in, whilst I put the other three supers that were on each hive above a clearer board. Just to complicate things, three of the hives also still had top brood boxes (BB) above a division board after a demaree! It all looked very tall and almost impressive until I wondered how I was going to shift so many boxes for extraction! Come Saturday morning and I had a cunning plan! The problem with plans is that they can always go wrong! I hadn’t checked the new porter bee escapes when I added them to the clearer boards. So on three of the five hives the supers were still full of bees! Plan B and I removed the four supers from the other two hives that were almost empty of bees besides a few stragglers. I then attempted to encourage the bees to leave one of the other supers with a puff of smoke and some removal of frames and shaking of bees off of them. I managed to clear one super but it was hard work and taking too much time. So I decided to swap the top BB below the supers. add another clearer board to each hive and come back later to see if it was working. A load of full supers in the back of my vehicle. With the supers loaded into the back of my car I set off to extract them. I use an electric powered 9 frame radial extractor that I purchased a couple of years ago from Maisemores at the BBKA Spring convention. Then of course it was a case of wheeling in the supers and uncapping any frames that needed it (not too many in this case) and putting the frames into the extractor. As the majority of this honey is from OSR and it is important to judge the right time to take the supers off and extract, when the honey has reached a low enough percentage of water content but before the honey starts to crystallize in the comb, I performed a shake test on each and every frame (over the sink!) before deciding if the frame was ready for extraction. The other important factor in using an extractor, especially a larger motorized one, is to make sure that, as much as possible. the frames are balanced by weight around the extractor. Once it starts to spin and gain speed you will know very soon if it is not balanced as it will try to dance around the room! I try to be as efficient as possible in that as soon as I up-cap a frame I place it straight into extractor as it often starts to drip honey. Also it is worth mentioning that honey extraction can be a very messy job and honey / wax does not come easily out of fabric / carpets. I use some clean dust sheets to cover the floor and clean down all surfaces I am using before and after extraction! 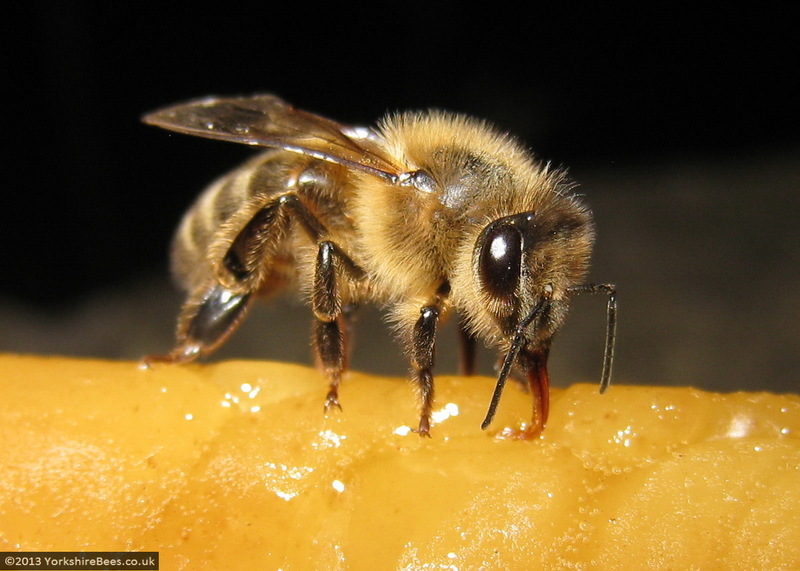 You may have a certain amount of honey that is already capped if you are lucky. Super frame with queen cells! I have encountered some brood, namely drones laid in super frames before and when I asked online, have been told that in any hive there will always be a few laying workers. These workers can only lay unfertilized eggs and therefore they all turns into drones. I have never seen queen cells on a super frame! I double checked the hive that the super was from and confirmed the marked Queen was still present in the brood box so I will mark this down to experience. Yes the cells that were sealed did contain larvae! Anyway back to the extraction and after some hard work un-capping the frames and extracting I always love the moment that I open the honey valve on the extractor the first time. Honey flowing from the extractor into the coarse sieve / bucket. I like to run the honey straight from the extractor through a coarse sieve to get rid of most of the larger particles of wax and any other bits before tipping it through a double strainer into the bucket it will be stored in. Once strained the honey will now be left to settle in the sealed buckets where it will solidify over the next month or so before I can then create soft set honey from it. With the extraction part of the process over and the cleanup afterwards the last thing left to do was to replace some of the supers back on their hives for the bees to clean them up and hopefully refill them! That was Saturday done with and I then repeated the process again with the remaining supers on the Sunday! A lot of hard work but very rewarding to have taken the first honey harvest of this year. I’ll finish this mammoth post with an interesting photo I took, see if anybody can guess what is happening / the circumstances? 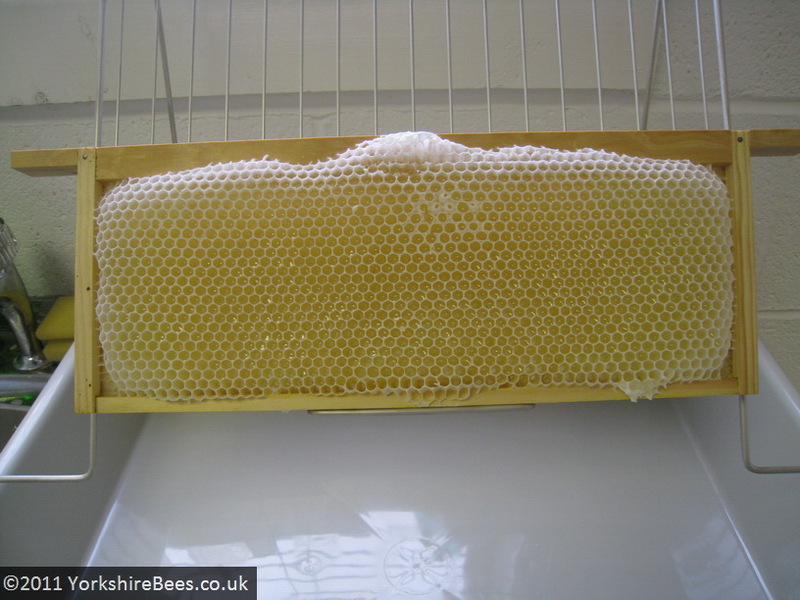 This entry was posted in 2013, Apiary 5, Bees, Brood, Drones, Eggs, Equipment, Hives, Lavae, Queen cells and tagged Beekeeping, Bees, Extraction, Honey, OSR, Super, Supers, wax. Bookmark the permalink. It’s definitely a sticky job! Have fn and hope you get lots of honey. I’ve heard of bees moving eggs/larvae before, could they have done this with the queen cells in the super? It seems an odd place to put queen cells – unless they were tactfully trying to keep their activities hidden from their queen! Puzzled by the yellow substance in the mystery photo, could it be very yellow crystallised honey or perhaps an ice lolly? When will the mystery be revealed?! Well I had also heard about bees moving eggs, however I was told by a very experienced beekeeper that it is laying workers that lay the drone brood in supers. However it was the first time I had come across queen cells! Regarding the mystery pic I will reveal the story in a few days time in my next post! Will look forward to the big reveal!